This issue starts off really good. We get to see Two Face just after he is broken out of Arkham, thanks to the efforts of Superwoman, as seen in Forever Evil #1. He is standing atop the Bat-Signal at Gotham PD HQ, waiting for the Batman to show up. But, we all know that this is not going to happen, for the Dark Knight, along with most of the other prominent superheroes, is dead at the hands of the Crime Syndicate. And now, Two Face intends to take full advantage of the fact. And therein lies a really great element of his characterisation: he flips a coin to decide whether he is going to be Gotham’s saviour, or its worst nightmare: “The Batman’s gone. Leaving me two choices… heads, I save Gotham. Tails, I make it bleed”. Tomasi presents a very introspective look into the character, one that I really enjoyed it. Its much more nuanced than any of his other portrayals that I’ve seen over the years, and it really gets into his character. Tomasi still plays a few cards close to his chest, but he gives us just enough to be able to connect with the character, which I did. Harvey is someone who still sees himself as Gotham’s saviour, even though he is now one of its worst criminals, a murderer and thief many times over. Yet, there is something in him that speaks out for the city, because he still has a connection to it. And the biggest connection is the notion of justice, for which he is unrelenting and vicious. In the second half, we see Harvey return to his old stomping grounds, the Gotham City Courthouse, where he used to work as the District Attorney before his… accident. From here on out, we see his past and present played off each other with a synchronicity that really shows how much he has changed. But, there in lies the rub. The second half is missing a key emotional element because the play off between the past and the present is dealt with in a very casual matter-of-fact manner. Additionally, there are some confusing narrative choices made. Earlier, we see him broker a deal with the Scarecrow, who came to him as a messenger of the Crime Syndicate in order to convince him to join the new world order, the Secret Society of Supervillains. And he does join, because we’ve seen him in the big splash page in Forever Evil #1 where the Crime Syndicate addresses all the supervillains who attend them at the site of the Justice League’s crashed Watchtower (Justice League #20). And yet, the way that Tomasi sets up the conflict between Two Face and the Secret Society lackeys here feels as if it is shoehorned in for the sake of it. There’s no real rhyme or reason to it. Its as if Tomasi and artist Guillem March skipped over a scene. Where the art is concerned, I really liked what March and colourist Tomeu Morey pull off. Their depiction of Two Face resonated with me. They do well to show off Two Face in all his hideous glory, without holding anything back. Scarecrow seems… odd at best, especially when he… struts, but that’s only one of a small handful of missteps with the art. The soft switch in colour palettes, once we go from scenes with only Two Face (and Scarecrow) to Two Face wreaking his brand of havoc through Gotham and in the Courthouse, is natural and adds to the story effect being constructed by Tomasi. Visually, Batman and Robin #23.1 is one of the better Villain’s Month issues, no doubt about it. The issue ends on a good note, but it leaves some questions answered: such as how exactly this issue fits in with Forever Evil #1 timeline wise and whether Two Face is indeed turning his back on the Society and the Crime Syndicate. For the most part, this issue is a great addition to Villain’s Month, but it could certainly have been better. Also, as I just finished re-reading Forever Evil #1 (for the fifth time, because I really like it! ), it appears that Tomasi has essentially simultaneously retconned the events of that issue, since according to Geoff Johns, Scarecrow gives Two Face the new Society coin while many of Gotham’s signature villains are gathered together in some ruin, at the invitation of Scarecrow himself. Also, in a visual context, Guillem March retcons one side of the coin. 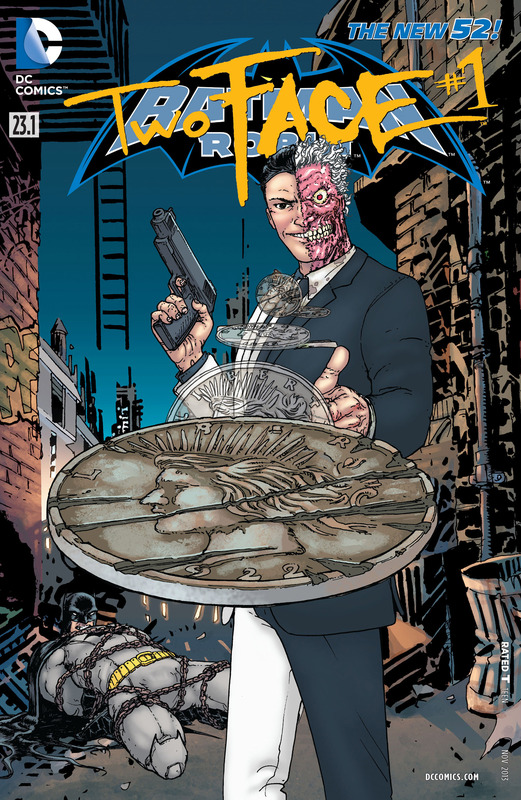 In Forever Evil #1, the coin has the symbol of the Crime Syndicate on one side and a reversed depiction of the North and South American continents. In Batman and Robin #23.1 however, the geographical depiction is replaced by an image of Owl-Man, who is the Earth-3 Batman, a villain however, not a hero. Very odd choices to make, and makes me question whether there was any communication between the Geoff/David Finch team and Tomasi/March. More Batman Villain’s Month issues: Joker, Ventriloquist. Posted on September 15, 2013, in 2013 Reading Challenge, 2013 Writing Challenge, Challenges, Comics Reviews, Review Central and tagged 2013 Reading Challenge, 2013 Writing Challenge, Batman, Batman and Robin, Challenges, Comics, Comics Reviews, Forever Evil, Guillem March, Harvey Dent, New 52, Peter J. Tomasi, Review, Review Central, Supervillains, Tomeu Morey, Two Face, Villain's Month. Bookmark the permalink. 2 Comments.